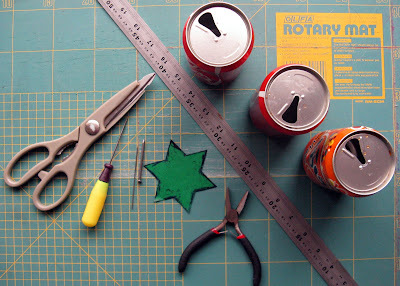 Ever since I blogged about my tin-can-star mural in June 2009 I promised to do a tutorial. I kept on putting it off because I haven't done any tutorials before and the whole idea seemed a bit overwhelming. 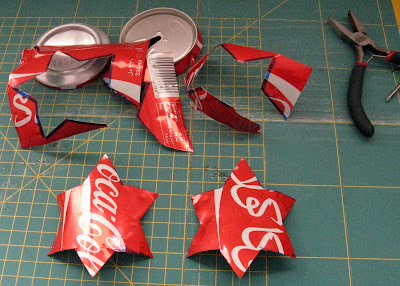 This tutorial shows you how to make the stars. 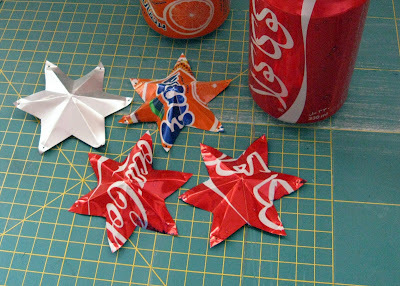 You can then use the stars to make anything you want from mobiles to Christmas decorations. 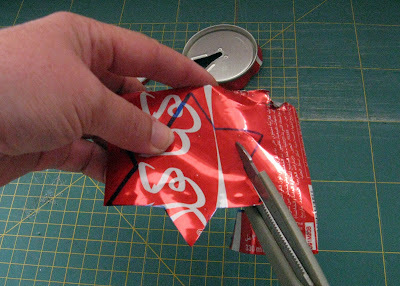 Start by forcing the one edge of the scissors into the can near the top rim and away from the logo. Cut all around. Cut from top to bottom. 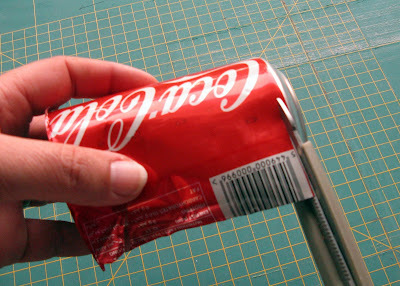 Make sure you keep the logo intact by cutting on the bar-code side of the can. 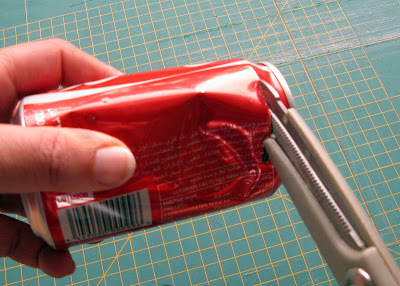 You can now clean the inside of the can to make sure your work surface and hands don't end up all sticky. 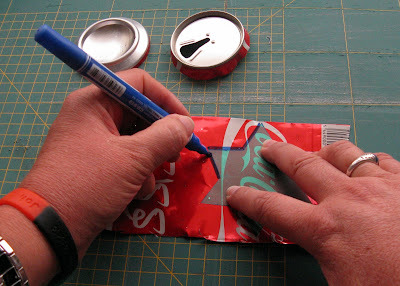 Trace the template onto the can with the permanent marker. 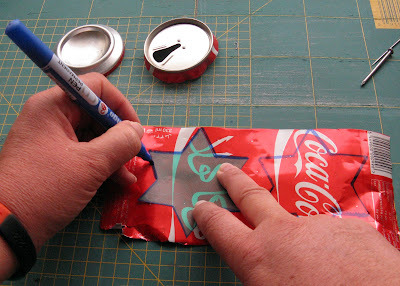 Make sure you place the template over the logo and in such a way that you can fit two stars onto each can. With the logo side facing up, line the ruler between two opposing internal corners. 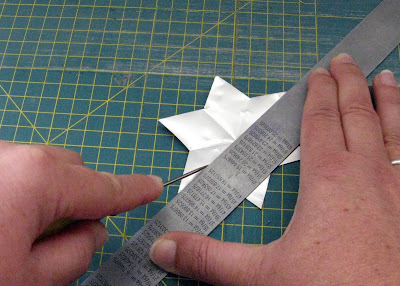 Use your sharp tool to mark a straight line. Make sure you don't cut right through the metal. Repeat with the other internal corners. Flip the star over. With the logo side facing down, line the ruler between two opposing sharp points. Score as before. Repeat with the other sharp points. 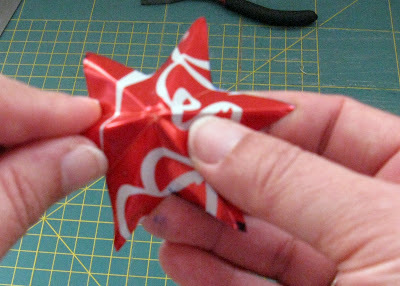 Hold the star between your fingers and fold on the lines. 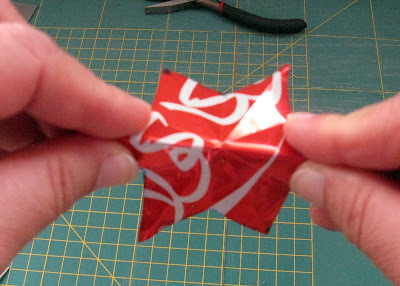 Repeat the folding along all the lines. 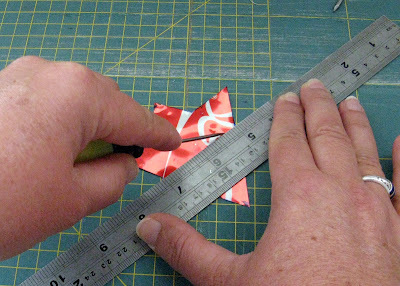 Use your sharp tool to sharpen the corners and edges. 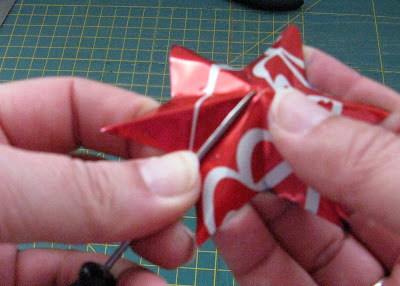 With your flat nose pliers pinch the sharp points of the star to flatten them and to bend them slightly upwards. 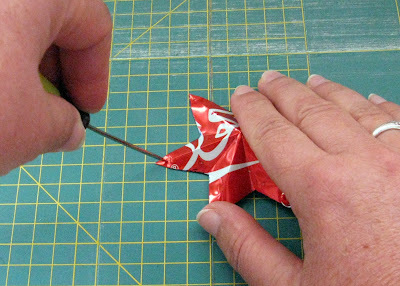 Hold the star down on the work surface and push a hole through the flat ends with your sharp tool. You can put a cutting board or cork tile underneath. 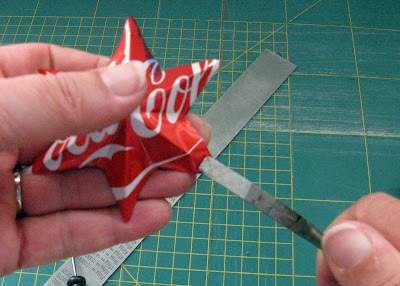 If you want the metal side of the star to be on top you have to change the scoring around. The shorter lines (between internal corners) on the metal side and the longer lines (between the sharp points) on the coloured side. I just love this idea!! thanks for sharing your template with us. 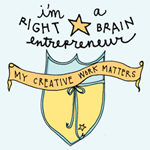 Thanks for sharing your tutorial - YOU are a star! I think these are so neat, thinking of doing some with beer cans and making a garland for my basement bar room, maybe I will put it up with some little Christmas lights. I love this! The only bad thing is now I'll have to drink sodas. I am glad you love it. You don't have to drink the sodas. Just ask your local bar or restaurant to save the empties for you. That's what I did. I love finding ways to re-use and re-cycle. This is a great idea and tutorial. I found you from One Pretty Thing. thanks a lot for the tutorial. You're great! The bars and restaurants use guns here mostly. 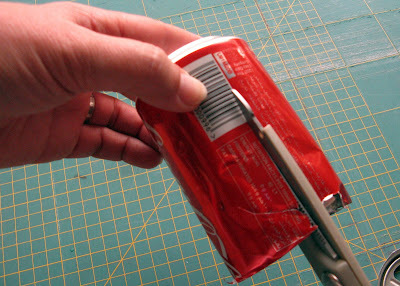 I will start looking for soda drinkers now. 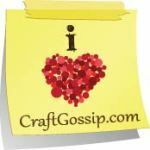 And I posted your link to all the groups I am on so you may get an influx! Thank you again for such a clever idea. 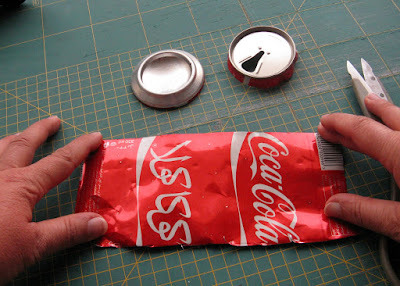 However, can hunt out some Passiona cans! 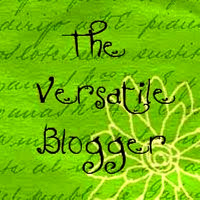 yes - i posted on the original via whip up - and now you have posted the tutorial - thank you - I admire your patience! 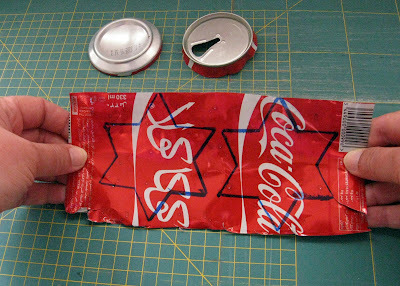 Hello, I , too, would like to get Arabic and Israeli soda cans and use them together as part of my Channukah display. Thanks for the tutorial! Que coisa mais linda , vou postar em meu blog ok bjuss !! vou fazer também,obrigada por mostrar a todos. This is a really neat idea! I love the idea of recycling and living green. This project fits right in with that way of living. Your whole blog is great. Adorei !!! Sou brasileira , professora de Artes e amo artesanato!